Trumbull's Patrick Lomnitzer controls the ball as Staples' Kosta Papa defends during Tuesday's lacrosse match at Trumbull High School. The barrage kept coming from all angles and directions, and Trumbull goalie Will Testani kept the Eagles in it. 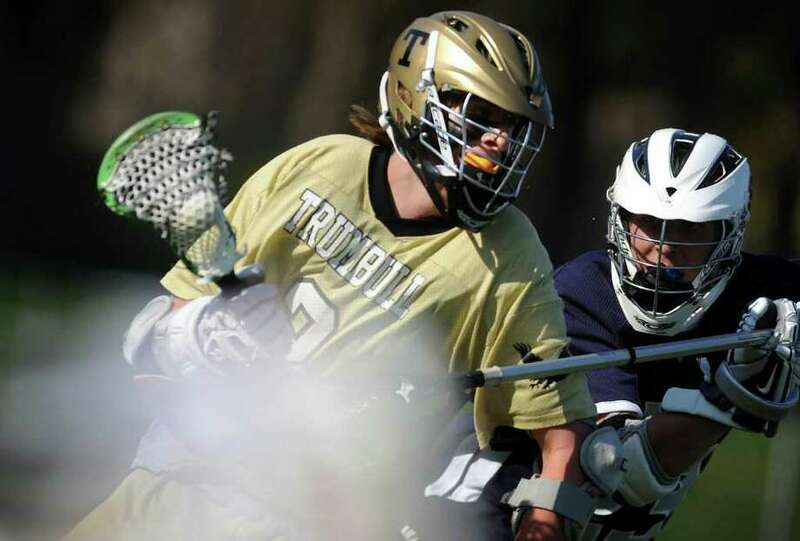 Staples never stopped, though, peppering the Trumbull net with more than enough shots to finally build a big lead and beat the Eagles 9-4 Tuesday at McDougall Stadium in FCIAC boys lacrosse. "I feel like a lot of our shots were decent shots," said Kip Orban, Staples' standout senior midfielder who scored four goals. "Their goalie played a great game. Our sticks were not on today. As soon as we get back to school, I'm going to go take a few shots." Staples (6-2) outshot Trumbull (2-6) 49-12. The Wreckers ground out leads of 5-0 at halftime and 7-1 after three quarters before the Eagles' Ken Kaczmarczyk scored three goals in the fourth quarter. The Wreckers put 25 of those 49 shots on the cage. Testani stopped 16. "Will played awesome," Trumbull coach Scott Zinser said. "He has been playing well, but it hasn't really shown in the scores." Trumbull has lost five in a row, giving up double-digit goals in three of those losses. It's a fairly young team, and midfielder Kaczmarczyk is the most experienced. "As you could see, he's our guy. Every other team knows it, too," Zinser said. "It's tough when you're the only experienced guy in the top six." But the Eagles stuck with Staples and gave themselves a chance to make it a game again in the fourth quarter. "They played us really well, really hard," Orban said. "We came out a little too flat." The Wreckers had enough at the start to take a 2-0 lead in the first four minutes. Charlie Ross (one goal, three assists) scored at 1:15, then set up Peter Paul (two goals). Staples, winning for the first time this year with less than 10 goals, didn't score again until the second quarter. By halftime, the Wreckers had 25 shots, and 11 missed the net. In the third, they scored just two goals on 15 shots, seven of them on the cage. "It's just a matter of finishing the ball," Orban said. "We're getting open shots, and we're either missing or hitting the goalie in the stick." A.J. Demasi cut into the lead early in the third quarter, but Orban (four goals) and Billy Lahiff (one goal, one assist) scored to give Staples a six-goal lead, more than enough for J.B. Breig (eight saves). The Wreckers, unbeaten last year in the regular season, had a three-game winning streak snapped Saturday at Greenwich. "It was good to come back from that," Orban said. "We're looking forward to the Weston game now." Staples was supposed to host Weston on Thursday but the game was postponed to Friday because of the weather. The game was then moved to Friday, May 13. Orban scored on a man-advantage late in the fourth quarter to make it 8-4. That was the Wreckers' only man-up goal, which didn't bother the all-state midfielder. "We got some good shots on man-up," Orban said. "We were working some good plays. We just couldn't finish." Jake Frimet (one goal, one assist) also scored for Staples. Matt Yeager (three ground balls) led the defense by preventing outlet passes. Greg Lewis and Joey Zelkowitz led the Wreckers with five ground balls each. Kosta Papadopoulos picked up three ground balls. Westport News sports editor Eliot Schickler contributed to this report.